Michael Lansing, associate professor of history at Augsburg College, recently was interviewed on Prairie Pulse, a program on Prairie Public Television. Lansing is the author of “Insurgent Democracy: The Nonpartisan League in North American Politics,” which examines both the history of the Nonpartisan League and its lasting effects on politics and community organizing. In the 25-minute interview, Lansing speaks about the genesis of the book, his research process, women’s involvement in the League, and many other topics. Watch: Prairie Pulse 1308: Michael Lansing on Prairie Public Broadcasting’s YouTube channel. 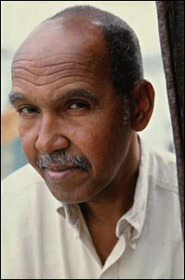 Nuruddin Farah, award-winning Somalian author and peace advocate, will visit Augsburg College on Wednesday, Oct. 15. He will read from his latest novel, “Knots” at 6 p.m. in Hoversten Chapel, Foss Center. The reading will be followed by a discussion, reception, and book signing.